Posted on 20, January 2016 by EuropaWire PR Editors | This entry was posted in Automotive, Metals and Minerals, Sweden and tagged Benefits of Docol R-Series Tubing, Chrome Moly 4130 material, Kim Colvin, SSAB. Bookmark the permalink. Attention to Docol R-Series Tubing is growing annually in the U.S. as race car manufacturers realize its benefits over the competing Chrome Moly 4130 material typically used for chassis and roll cages. STOCKHOLM, 20-Jan-2016 — /EuropaWire/ — As an integrated mill producing the steel as well as the tubing, SSAB has been able to develop a more consistent, ductile and welder friendly product compared to the Chrome-Moly Tubing 4130 material, according to Kim Colvin, RSM, Americas’ Automotive. Chrome-Moly 4130 has been the typical material used for parts like roll cages, chassis and frames in racing cars. It is composed of the alloying elements Chromium and Molybdenum and hence the name Chrome-Moly. The Docol R Series tubing is highly ductile particularly in the heat affected zone and can absorb a great deal of energy before cracking unlike the competing Chrome-Moly material. This is important from a safety perspective in a crash situation. As such, more than 40,000 feet of Docol R-8 tubing (named R8 to represent tensile strength of 800 MPa) has been shipped in the U.S.in 2015, a 56% increase in sales over the year before, according to figures from A.E.D. Motorsports Products. A.E.D distributes the Docol tubing in North America for SSAB for various applications in motorsports in addition to bicycles, OEM recreational equipment, tools and support equipment. SSAB recently exhibited at the PRI trade show (Performance Racing Industry) to educate more people about R8 tubing and its use for safety critical applications as well as to increase awareness of SSAB’s production capabilities. The staff also held daily seminars at the show. Almost everything you need to build a race car or racing bike can be seen at this show—from fabricators of roll cages and chassis to engines, suspension, racing apparel, wheels, software and more. The show was held recently in Indianapolis, Indiana—the hub of motor sports in the U.S. and home for many of the racing teams. SSAB’s Docol tubing passed stringent tests and was approved in 2012 by the SFI Foundation which administers standards for quality assurance of specialty performance and racing equipment internationally. The approval was expanded to all SFI drag racing chassis in 2015. Beyond drag racing, the product is growing in popularity among other applications as well. “We’ve received inquiries from rally car manufacturers, late model dirt and off road vehicles as well as from NASCAR wanting to know more about the material,” said Kim. Docol R-Series Tubes had been produced in Borlange but production will be moving to Finland in the near future primarily at the Hämeenlinna plant or Lappohja as a second option. 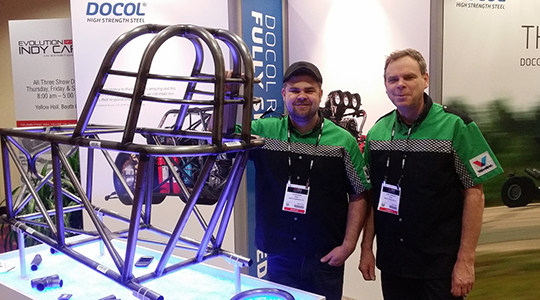 LG Eriksson and Mats Eriksson, from ME Racing in Sweden, in front of a racecar chassis made of Docol R-8 tubing. ME Racing has worked with SSAB from the start to introduce the R-8 tubes to the racing industry.